Am I able to refill your Lexmark premium cartridges for the Lexmark S605 using bottled ink? We don't sell a refill kit for use with Lexmark Interact S605 print cartridges so we wouldn't advise that your refill these cartridges yourself. All of our premium brand compatible Lexmark S605 cartridges have already been professionally refilled so we recommend using these cartridges as a way of saving money. Lexmark updated the firmware for the Interact S605 about a year ago. Since then (for those who have updated the firmware), only genuine Lexmark cartridges are recognised by the printer. It seems that the new firmware checks the small RFID chip which resides on the cartridge itself: if it's not a Lexmark brand, the printer won't accept the cartridge. Are your cheaper alternative inks for the S605 (100 XL for example) still compatible with this printer? As far as I'm aware, providing that the printer was purchased within the UK, then our compatible Lexmark Interact S605 cartridges will be compatible with your machine. However, if the cartridges are not recognised then you may need to scratch off a strip on the chip. These steps are outlined in the instructions which are included with the cartridge. If you experience any difficulties with Cartridge Save products please contact our Customer Care Team. Can I use Lexmark S605 cartridges in an S600 printer? Unfortunately, we do not list the Lexmark S600 as a printer. It's likely that you're referring to the name of the series (Lexmarl Interact S600) rather than a specific printer model. If this is the case then the Lexmark 100 / 100XL cartridges we list for the Interact S605 printer will work in your Interact S600 series printer. However, we recommend that you find the exact model name for your printer to avoid ordering the wrong cartridges. Hi, my Interact S605 printer has stopped printing in black. I've checked it on the display and it says it has between 1/5 and 1/4 left in the cartridge. Is it likely the cartridge is empty and the display is just a little optimistic? It's possible that your Lexmark Interact S605 black ink cartridge could be empty. To ensure that it is not a printer fault I would suggest turning the printer off and back on again and let it re-start. If this does not clear the error I would insert a new cartridge. If the printer does not print with the new cartridge, you may have a blocked printhead. I would then suggest running some cleaning cycles and nozzle checks, you can find how to run these in your printer manual. Hunting for the most affordable prices on your printer ink cartridges? To find fantastic discounted deals, plus much more, get your replacement inks with Cartridge Save. Our company specialise in the provision of nothing except cheap Lexmark Interact S605 ink with our famed customer services. Searching all day to buy the best ink cartridges is a great way to waste time Now you can quit spending hours comparing deals because the best deals are to be found here. Start saving some money and free time - order at Cartridge Save now. Get complete satisfaction if you order from Cartridge Save thanks to the cast-iron thirty day refund guarantee that comes as standard . Should you have issues with your ink cartridge inside thirty days after purchase you simply have to mail it back for your total cash back. There's more, every Lexmark Interact S605 cartridge comes with free overnight delivery. The Lexmark Interact S605 is an all-in-one printer that stands out from all the rest with its excellent features and affordable price. It can copy, scan, and print even without a computer. It has a PictBridge port and memory card readers plus a 4.3 inch touch screen display, which has a screen saver. However, the photo printing quality needs some work and the Lexmark Interact S605 does not support Bluetooth. With dimensions of 7 x 20.24 x 14.09 inches, the Lexmark Interact S605 is perfect for small spaces. It has a flatbed scanner on top of the printer and features an LCD display that offers SmartSolutions. Print even without a computer with the Lexmark Interact S605. This all-in-one printer can also scan, copy, and send e-mails with just a touch of a button. Users can make their own short cuts on the LCD display using SmartSolutions. To save users even more money, the Lexmark Interact S605 provides a duplexer for automatic 2-sided printing and has a feature called EcoMode. 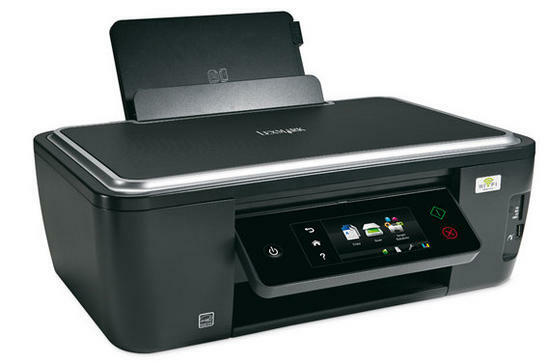 Workgroups will find the Lexmark Interact S605 very useful as it has built-in Wi-Fi. Printing jobs are also rather speedy (maximum 33 ppm for black). The Lexmark Interact S605 does not have an automatic document feeder. The output tray capacity is low (only 25 sheets). Replacement inks for the Lexmark Interact S605 are also a little pricey.